I know this is not cold for some of y'all... but its freezing down here... literally Clipped the mini cattails the other day. Sunk the pickerel weed to keep the roots from freezing. And I had to give the pitcher plant a haircut. There was an inch of ice on the stock tanks... go deep my Enneacanthus friends! Just joking around here of course, I hope no one is having any serious trouble from the weather. I have around a 500 gallon patio pond around 18 inches deep in spots. Checked it today and there was only 4-6 inches of water on the bottom that wasn't iced up even with some flow from a partially frozen waterfall. Never had ice to this degree since I built it 10 years ago. Fish, including various Lepomis and minnows, seemed to be doing ok when I thawed out a section to check on them. Supposed to warm up starting tommorrow so I think we're good. I'm putting bottles of hot water in the mudminnow tub twice a day and covering it with styrofoam at night to keep it from freezing too deep. Yes those are YOUR juvie mudminnows-to-be Michael! I'm afraid I may lose the adults in the wading pool if it freezes to the bottom. No way to cover that one. My 100g stock tank pond is frozen thicker than ever, too. Was easily 4" thick a couple days ago. Just gave it a couple good whacks with a three pound sledge to almost no results. No idea how thick it is now. I'm wondering about my Enneacanthus too, Michael. A "census" late this summer showed I am down to one adult in the pond, but very late this fall I saw two quite small juvies swimming around in there! I can't imagine I missed any other adults while I was in there, they must've left a legacy just before they croaked... Second spawn in there in two years that I know of. Minus 5 this past Wednesday here in northern va. My half buried 300 gallon stock tank looks to be frozen solid. It had about a half dozen goldfish and a group of long eared sunfish. I'm keeping my fingers crossed that a pocket of unfrozen water will let something survive!!! Even animals at the zoo that have outside access are like, Noooooooope! in the District. Keep in mind that the force of that sledge hammer is transferred to the animals under the ice and the walls of the container. Just gave it a couple good whacks with a three pound sledge to almost no results. Very good point. I had considered that regarding the pond walls. Somehow managed not to draw the connection for the critters inside. Hopefully I didn't just give them the stock pond version of dynamite fishing! Do not automatically assume that fish frozen in ice are dead. I was doing some research on mosquito control by fish in backyard ponds a couple of decades ago using fiberglass raceways about 30 inches deep sitting on the ground. I was late in getting the fish out for the winter one year. 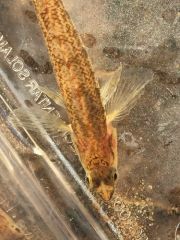 Numerous variatus platies, golden shiners, fathead minnows, goldfish, and koi were motionless in tight icy slush. I collected them and put them in tubs in my basement. One-half to two-thirds of them survived, even with several dying during the next month, apparently from internal injuries. The koi had a higher survival rate than two-thirds, but the other four species had about the same long-term survival - one-half to two-thirds. Those that survived may have suffered some internal injury as they tended to be short-lived after the ordeal. Most died within a year or two of the exposure, but they lived long enough for reproduction. By the way, all but the koi provided 100% mosquito control within four days of mosquito larva introduction. 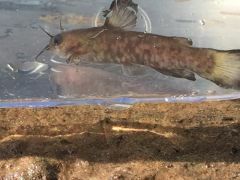 The intent was to use species easily available by homeowners at bait shops, pond stores, and aquarium stores. I chose the variatus because I knew they were cold-hardy, but I didn't realize they were that cold-hardy. Their survival was slightly better than the golden shiners, fatheads, and goldfish. Just to make you southern guys feel better, we've had several days of minus 14 and 15 degree zero temperatures during the last ten days. That's still warm compared to our Minnesota friends. My wife, Carie, and I emptied our 11 stock tanks and brought the fish indoors in October. It's an annual event for us northern folks. Mike Lucas sent me some eastern mudminnows about 10 years ago during winter. Took about two days longer than priority mail usually takes, package arrived, bags were solid Ice balls. No visible liquid. I don't remember the exact number of fish, but I believe it was 4. If I recall correctly, we only lost one. Still prefer the odds shipping fish during winter, rather than summer. Well, at least there's not much risk of leaking when they're frozen solid. 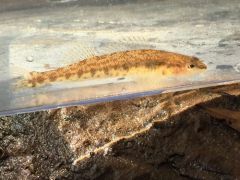 Mudminnows may be exceptional in regards to freeze-tolerance. Phil's account of the X. variatus survival surprised me! 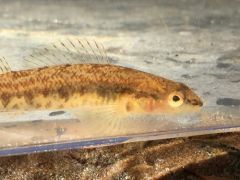 I've read about mudminnows found in 33 degree water here in Wisconsin. Edited by TimothyHD, 09 January 2018 - 08:43 AM. In nature they can find little seepage spots in the stream or lake bed at near-freezing temp that gets slushy but doesn't freeze solid. My above-ground plastic tubs don't offer that refuge option. If all the water freezes, the question becomes how cold can the ice around the fish get before the fish is killed? And if the cold doesn't directly kill it, how long can it stay encased in ice before suffocation kills it? These seepage spots or springs, can even affect large reservoirs. Find a spring inflow and you will find fish stacked up. This time of year, boat fishermen can key in on these areas and drop bait in front of large numbers of fish taking advantage of them. I know guys that live for finding these areas and catfishing in December. Phil's platies surprised me, too. I'm hopeful my tub didn't freeze solid, but it sure made a try at it. 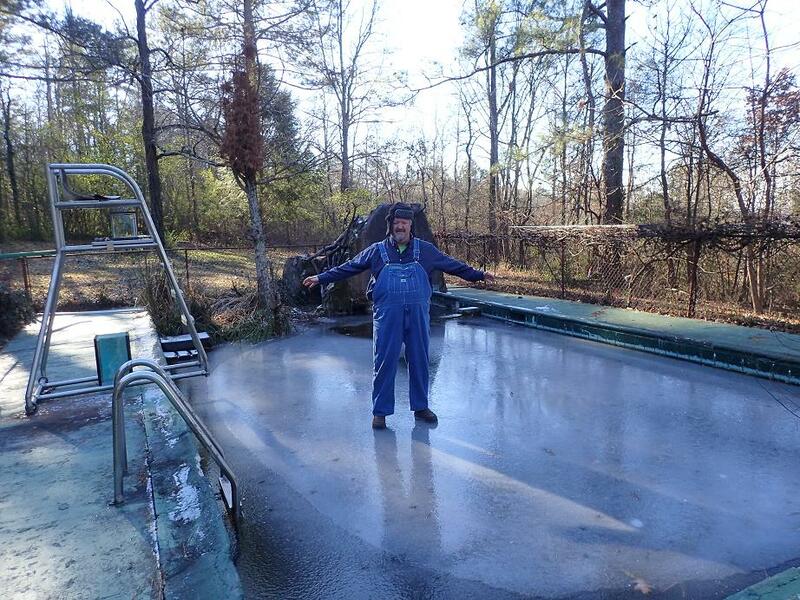 The Cement Pond has froze over a few times in the 15 Winters we've lived here. This cold Winter it is frozen solid with about 2 or 3 weeks of below freezing nights. Come Spring it will be good to see how the other critters fared. It's 8' deep so plenty of thermocline layering and the cycling waterfall keeps it aerated. Paint a couple face-off rings on that puppy, slap in a couple cages and get some game on! two were caught. There was also a bass and sunfish hiding which I was unable to catch with the dipnet. 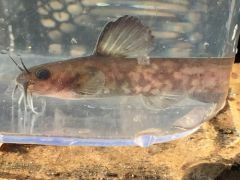 And I was overjoyed to catch this Snail bullhead (Ameiurus brunneus). 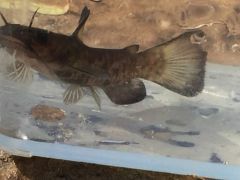 This is the first time I have ever caught a catfish with the net and this is a new species for me. Another one was seen, presumably the same species.